The graceful curve of an aging Japanese bridge is nothing short of pure art. Form, function, spiritual significance: people report feelings of peace just from crossing or hanging around Zen-inspired bridges. Even Monet felt moved to create a masterpiece based upon the Japanese bridge. Without question, the most famous Japanese bridge in all of Vietnam - if not all of Southeast Asia - is found in the historic riverside town of Hoi An. Constructed sometime in the early 1600s, the Hoi An Japanese Bridge is a symbol of the town and a beautiful reminder of a time long ago. The presence of a Japanese bridge in a Chinese-influenced Vietnamese town is no accident. Thanks to its close proximity to the South China Sea, Hoi An was an important trading port for Chinese, Dutch, Indian, and Japanese merchants up until the 17th century. The Japanese traders were the dominant force at the time; many of the old houses in Hoi An reflect their influence. Today, the Hoi An Old Town is a UNESCO World Heritage Site, drawing thousands of tourists who come to step back in time for a brief visit. The Hoi An Japanese Bridge remains a symbol of the significant impact that the Japanese had in the region at that time. The bridge was originally constructed to connect the Japanese community with the Chinese quarter - separated by a small stream of water - as a symbolic gesture of peace. Although his work has been appreciated for centuries, the builder of the bridge still remains anonymous. Roughly 40 years after the Hoi An Japanese Bridge was constructed, the Tokugawa Shogunate demanded that its overseas citizens – mostly traders sailing around the region – to go home, officially closing Japan to the rest of the world. The small shrine inside of the Hoi An Japanese Bridge pays tribute to the northern deity Tran Vo Bac De who reputedly controls the weather - an important thing considering the seafaring traditions and notoriously poor weather around Hoi An. The reasoning for the conspicuous statues of a dog and a monkey on opposing sides of the bridge is disputed. Some local guides claim that construction of the Japanese bridge began in the year of the dog and was completed in the year of the monkey. Others say the two animals were chosen to guard the bridge because many Japanese emperors were born either in the year of the dog or monkey - lending them sacred significance. The Japanese bridge has been renovated a total of seven times over the centuries. The wooden sign at the entrance of the bridge was hung in the early 1700s, changing the name from "Japanese Covered Bridge" to "Bridge for Travelers from Afar". Previously, the bridge had changed names several times, from Lai Vien Kieu "Pagoda in Japan"; to Chua Cau "Covered Bridge"; to Cau Nhat Ban "Japanese Bridge". During their colonial hegemony, the French removed thresholds and leveled the road across the bridge to support motorized vehicles during their colonization. The changes were later undone and the bridge pedestrianized again during major restoration in 1986. As of 2016, an eighth renovation is urgently needed. The river water has eroded the bridge support's structural integrity, and the whole structure's location in the most flood-prone area of Hoi An Old Town makes it particularly vulnerable in typhoon season. The authorities plan to dismantle the Japanese Bridge for restoration and repair purposes before the structure completely breaks down in the next flood. The Hoi An Japanese Bridge crosses a small canal on the west end of the Old Town, connecting Nguyen Thi Minh Khai Street to Tran Phu Street - the main thoroughfare along the river. Art galleries and cafes line both sides of the peaceful street beyond. 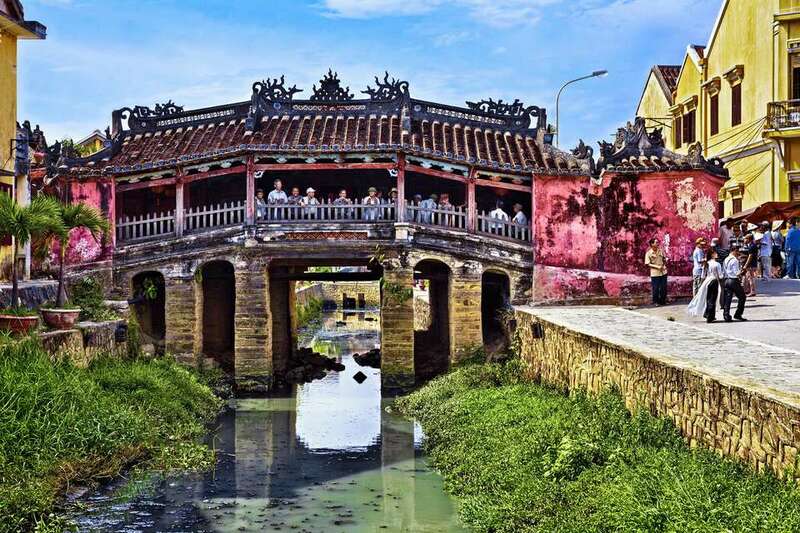 Although anyone can photograph the bridge, crossing the Hoi An Japanese Bridge requires a coupon included in the entry fee for Hoi An's top 22 Old Town attractions.